English oak boards are regularly used for internal flooring, but designers are increasingly specifying them for external use as well. The warm and tactile appearance of oak is highly attractive while the natural durability of the wood, together with its toughness, makes it the ideal specie for upmarket decking installations. Oak decking is the ideal choice for designers who want to specify a hardwood deck but feel uneasy about using tropical species. Although oak is not as hard or durable as species such as opepe or balau, it is well suited for use as decking where it will be elevated off the ground. 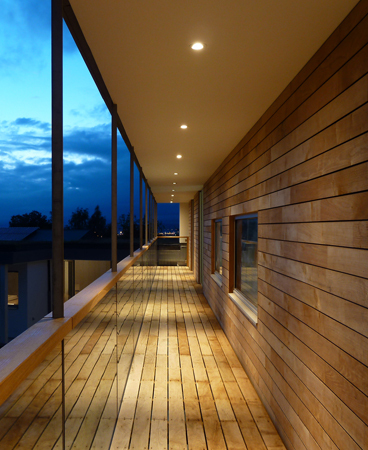 The air dried oak deck boards supplied by Vastern Timber are manufactured in-house from English oak logs sawn in one of our two sawmills in Wiltshire. This enables us to monitor quality and moisture levels carefully to ensure the deck boards are suitable and safe for decking installations. 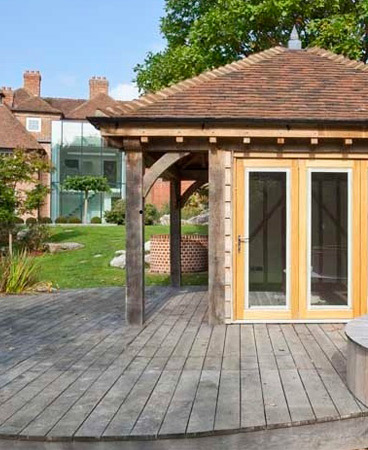 Vastern Timber offers a range of standard sizes and profiles for the air dried oak and can also accommodate bespoke requirements. One feature of oak decking that must be considered is the high tannin content. During the first few months after the decking has been attached, tannin will exude from the boards, resulting in streaks and stains where it comes in to contact with masonry or render . Tannin also corrodes ferrous metal, so it is therefore important to use either stainless steel fixings. Additionally care should be taken to keep other ferrous metal such as scaffolding away from the decking to avoid staining of the boards. Appearance New oak is often described as straw coloured. As the boards weather the colour will change to a silver-grey patina. The boards will contain small knots up to a maximum size of 50mm. Air dried oak may develop small surface checks (cracks) in warm weather. These do not affect the strength of the timber. Weathering Oak will weather to a silver-grey patina although oak decking can respond badly to certain environments causing the wood to blacken. Resistance to fixing High. Predrilling necessary. When to fix Ideally Autumn and Winter months. Avoid hottest months. Grading BS1186-3 1990 Class 3. EN942:2007. J30. Regular small and occasional medium sound knots. Extractives Oak contains tannic acid, which will corrode ferrous metals. When the two come into contact, a blue sludge is formed that will stain the oak and anything else it meets. All fixings used in conjunction with oak should be stainless steel. Tannic acid could also leave unsightly brown stains on the surface of the decking and will stain any porous materials below the decking. The reactivity of tannin makes oak cladding unsuitable for polluted areas and shaded areas.